I grew up shy. Dutiful. Obedient. Friendly enough for a preacher’s daughter, as friendly as required, but shy without question. My father left us for another family before my eighth grade year; that didn’t do anything but deepen my insecurities and doubt. Shyly I entered college, with a course long charted for medicine. My first B threw me into upheaval and, via a story far too long to share here, redirected me to instead study Pre-law. I majored in Political Science and minored in Speech. I hated speaking in public! I threw up before every speech. This continued on in to law school, but I continued to speak, with toothpaste always nearby. Fifteen years after graduation, I find myself celebrating my 40th birthday on a ship I regularly feel is beyond my class, charted for a course I feel incapable of completing. Apparently, in this whole faith thing, being humanly incapable of achieving your dream is actually a good thing. Or so I’m learning. Being humanly incapable of achieving your dream is actually a good thing. The course was not straight or easy. The boat is not even the same one nor does it resemble my boats charted for dreams long gone by. I spent my early 20s fighting my faith. I spent my late 20s fighting men. I spent my early 30s fighting infertility. I spent my mid 30s fighting the pressures of “it all.” Throughout these years, I fought to stay in control. To chart my OWN course. Even when I prayed, read scripture, and lead bible studies, I fought God for control. This is what I’m learning. It’s not about the fight. The fight that comes because of a struggle of wills. Your’s against God’s. Surrendering to the one true captain who knows no bounds, whose ship has no class restrictions, whose course has no limitations. I’ve learned that this dream in my heart, to serve people in need of God’s grace, looks different, but better, through His telescope. At least, what I’ve seen glimpses of thus far. This is who I am. I am a woman who loves God, my husband of seven years, and my miraculous three children who were born sixty seconds apart four years ago. I am a full-time attorney for a global energy company. I love my work and do it well. I love to write – more than just about anything else besides my family and friends. I’ve written a blog for three years, which began as a chronicling of the triplets story. Then God turned it into a refreshing spot for working women of faith. I published my first book about leadership for women this summer, Learning to Lead. I have an incredible crew of girlfriends–God well knew I would need them to survive this dream He is revealing to me bit-by-bit. I am stubborn and opinionated and vocal; for over two decades I had no idea this existed in my spirit. I’m now learning how God can use it, if I will first let Him tame it. Even all those shy insecure years ago, though, I was a dreamer. *This post has been edited from the archives, January 2, 2014. I feel like I begin often. If I’m honest, I’m a great starter-upper, but not such a great follow-througher. Maybe it’s that the follow through requires discipline that I don’t have, or maybe it’s that I never should have started whatever that thing was to begin with. Whatever the reason, I’ve realized that while beginnings are great and shiny and wonderful, real dreams require the follow through to actually work. Real dreams require the bravery to keep going when no one is there to cheer you on. This past year was another beginning, and another, and another. It was the year I actually stopped counting which house move number it was because keeping track just seems so exhausting. After ten moves does it really matter? It could be eleven or eighty-seven, but the point is we began again. We started over in a new school district that seemed more promising for my son, who was diagnosed with learning disabilities earlier in the year. It was the year I poured into and over and around for friends who were hurting and searching. It was also the year that, after pouring out into everyone else’s encouragement bucket so much for so long, my own encouragement bucket seemed to spring a leak. I told her how, as hard as I tried, I didn’t know how to get that bucket-filling girl back, let alone do all the encouraging, inspiring things she had done. Frankly, I didn’t care to get her back. The vessel I’d used to fill the emotional buckets of everyone else (including myself) was shattered in a million tiny pieces. I knew I was broken. I wanted a magic wand to fix me and put me back together again but all she gave me was a nod and a mint as I walked out. (So I could leave a peppermint-scented trail as I rode off on my broomstick?) I didn’t leave her office feeling better. In fact, I felt worse because I’m not a cryer. I am the one who pats everyone else on the back as they cry, and here I was in the office of a stranger, ugly crying and single-handedly keeping Kleenex in business. Somewhere in the course of the next few days I was having a little talk with the Lord. Except it was mostly me doing all the talking, angrily kicking myself for losing my mojo while simultaneously asking God why He would even need [ahem] “my services” anymore, since I had nothing to offer. I knew that He loved me. But to know He loved me wasn’t enough. I needed to know that He needed me. My heart needed confirmation that even though all of my own goals had already been met, He still had more work for me to do. I needed to know there was something at the end of wait. I needed to know that He had goals for me beyond what I had for myself. It was then that the whisper came right into my heart. He who began a good work in you is faithful and just to complete it. I was reminded ever so gently that God doesn’t start a project only to discard it and walk away in lieu of the next shiny thing. I may be an expert in beginnings. But not God. He is an expert in beginning, continuing, and finishing. He is faithful to keep working in us even when we’re ready to throw in the towel. 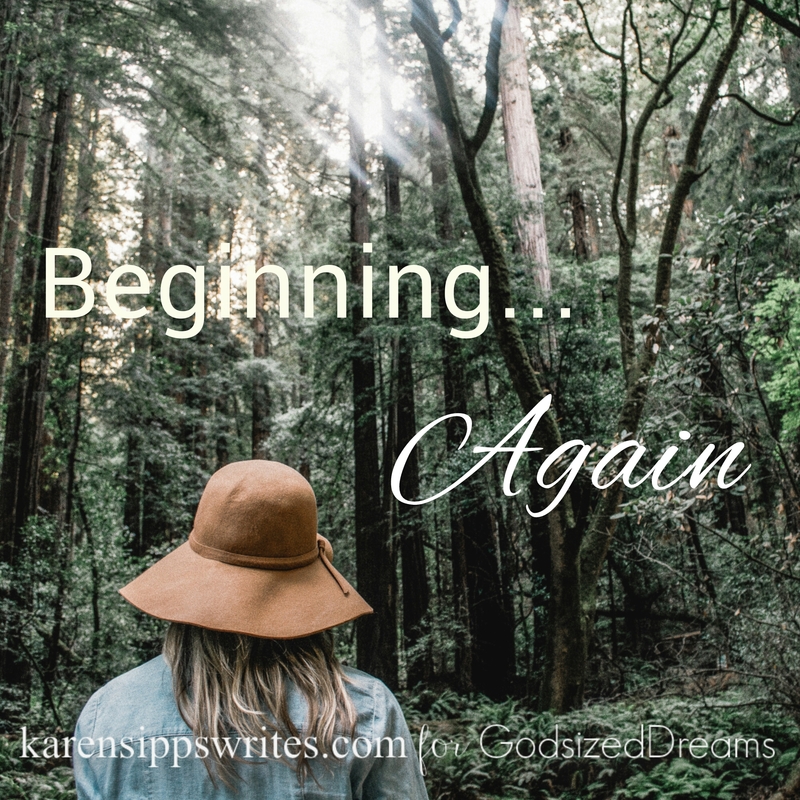 That simple truth – that He’s not done with us, and is continually working in and through us – allowed me to begin again, refreshed and renewed with the understanding that I am not only loved, but needed. It has given me the freedom to not only continue working on past projects, and prayerfully consider new projects, but to also wait for the next task, trusting that a restful period now does not mean God has nothing for my future. If you, like me, have thought of throwing in the towel… don’t. God’s not done with you, even if you don’t have an assignment at the moment. Maybe the road has been rough and full of rejection and mocking and doubt and you’re not even sure you want to keep going. Think about this passage from Jeremiah 18 and remember, it’s okay to begin again. Yes, the potter started. Yes, the potter started over when he saw the clay had strayed too far from his vision. But the beautiful thing is, the potter never took his hands off the clay. Even when he began again, the clay was never out of the potter’s grasp. Yes, we may have started a project or assignment and then stopped. Maybe that stoppage is just God redirecting us to something even more beautiful. But either way, He’ll never let you go. You are loved… and needed. if man will only make room for Him. As we enter into the second week of Advent, I find myself longing for quiet in what is arguably the busiest as well as the most wonderful time of year. 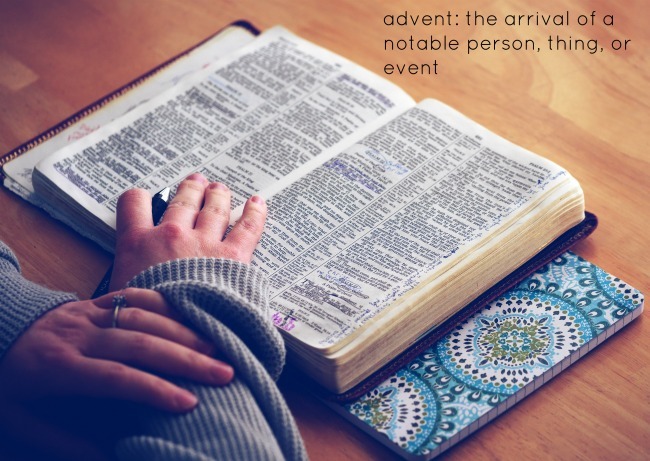 Advent is a welcome daily invitation to step away from the hype of the holiday season and to reflect upon the glorious story of our salvation. It is a time of waiting and preparation for the celebration of the birth of Christ. I’m familiar with this. As each of our six children was born, there was also a time of waiting and preparation. Even as the new baby took up increasingly more space and stretched the boundaries of my belly, I began to strategize how we’d make space in our home and schedule for his or her arrival. Bunk beds were assembled. We strategically rearranged and positioned toy boxes, dressers, and cribs. Considerations and decisions about schedules, bedtimes, and who would or wouldn’t keep who awake were made. We had to make room for the expected baby. This season of Advent is a time to make room in our hearts, minds, and schedules for Christ. The commercialization of Christmas has one message, and it’s more—more activity, more food, and more stuff. But welcoming Christ inherently requires denying other things to make room for Him and the manifestation of His will in our lives. Christmas and the invitation to focus and intentionally prepare our hearts and minds to receive and celebrate Christ again avails us of a very personal and unprecedented opportunity. He incarnates, becomes flesh, in us through the outworking of our obedience, relationships, and unique role in His body. His incarnation in our lives is manifested in our dreams. This Advent season, take a few minutes to consider . . .
How are you preparing and making room for Jesus during this waiting time of Advent? What might need to be rearranged or even gotten rid of to make space to more fully receive and embrace God’s will for your life? 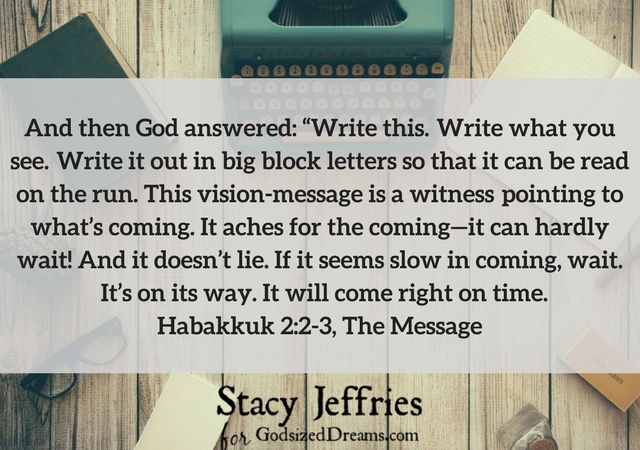 What new God-sized dreams are gestating in your heart? 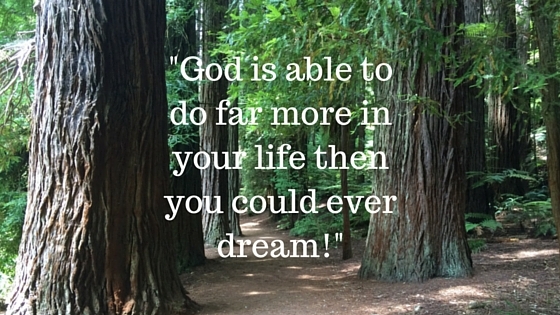 God is able to do far more in your life then you could ever dream! I had read years ago that once in your life you should take a trip by yourself slowing down, thinking and praying over what God has in store for your life. As I prepared for this trip I prayed that God would show me what His plan was for the next chapter of my journey and He sure did in a big way! I had always been a huge fan of Holley Gerth’s books as her words always seemed to speak to me at the times in my life when I needed to hear them most. 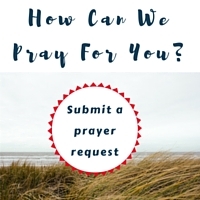 During this trip, I came across a blog post from Holley and as I read it I noticed a small box at the bottom that read “Would you like to see Holley Live?” As I clicked on the link it led me to a women’s retreat called Winsome in PA.
and should attend the retreat that upcoming March. I booked my ticket not knowing what God had in store for me but knew I was meant to be there! Holley Gerth was the Keynote along with so many other incredible speakers. Holley spoke on the topic of opening your heart to your God-sized dream. I remember leaving the session knowing that my life and career was about to be turned upside down. I remember hearing God say ” I have a different audience in mind for you.” I had spent the last 13 years doing work I loved as a Speaker, Trainer & Coach in the corporate world but I so desperately wanted to make a greater impact in the lives of women! That September I flew back up to PA and started the process of coaching this amazing group of women. God has opened up so many other doors this year to coach and work with other wonderful women. In 2015 I left my corporate position and launched my own coaching company called Defining Your Joy LLC. We work with women all over the world helping them through the process of discovering and launching their God-sized Dreams. We are a team of Women with skill sets including Legal, Accounting, Marketing, Sales, Grant Writing & Nonprofits and so much more. We come alongside these women to help provide education and motivation along their journey. My Journey has not been easy and has truly pushed me to grow! In May God opened up the most amazing doors yet! I was asked to join a team of women that speak and teach on behalf of a volunteer organization called Wellspring Living in Atlanta, GA. They work to help rescue girls some as young as 9 years old that have recently been saved from situations of trafficking. Through my God-sized journey, I am currently able to spend a few hours each week teaching these girls a course on what it means to live a life with intention. Helping them to see that they have the opportunity to write their own story. They are for the 1st time learning what it means to dream! Open your heart and trust…God has already done far more than I could ever imagined or dreamed! I can’t wait to hear what he has in store for you! I wanted to drop you a message. 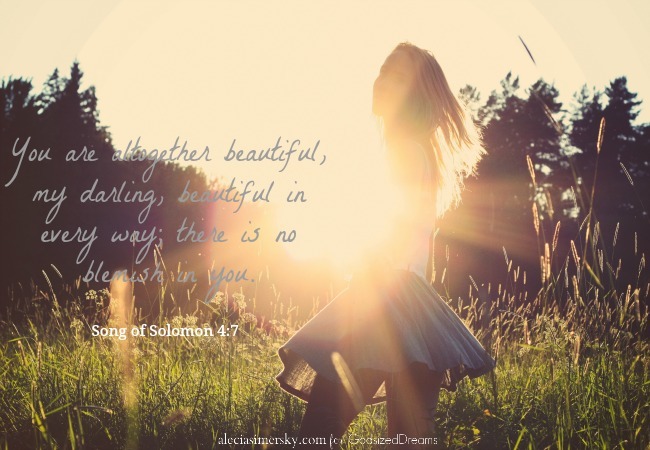 A few words of advice from your older sister in the faith. I see your eyes shining with idealism and promise. I want to encourage you, and caution you, if I may be so bold. I’ve loved and mentored some precious teens and 20-something women of promise and expectation, and I’ve seen how easily we can get lost on this journey. I know firsthand how quickly you can lose your way – I spent years chasing the wrong things in my 20s. A simple caution first: don’t ever let money be the reason for a decision. I heard a young woman just this week say she wished her boyfriend had more money. She looked at her friends and their pricey adventures and outings and longed for it herself. She let the lure of what money could buy distract her from the precious gift she’d been given. Second, but closely related, cheer instead of compare. I know it’s hard. Heck, the entire country conspires to have us compare ourselves, so we’ll buy more and do more and work out more and spend our time yearning for more. Even after decades, I look at other women and can find myself wanting their dream or parenting style or weight or career. There is a specific purpose God has for you and ONLY you. There are works that God has prepared in advance for you (Ephesians 2:10). He knew exactly who you would be because He made you that way. He needs your unique voice and body and style and passion and perspective. It is okay, even useful, to admire others for achievements they have made – admire, not desire. When our eyes are on the Author and Perfecter of our Faith (Hebrews 12:2), then we can cheer others on instead of tear them down or compete against them. Third, and last for this little note, would you guard your heart (and mind?) (and body?)? I have watched with great heartbreak the destruction the enemy can wreak on the most promising young dreamers. The devil knows if he can take you out early, he can keep hundreds or thousands of people from knowing who God is because he dimmed your light. If you have run away, or if you are living with someone just to feel loved, or if you are suffering under addiction to drugs or alcohol, you can come back. You can return to those who love you and believe in you. You are welcome, day or night, in the arms of Father God. And for you who are fighting the fight against what your peers or the world or the talking heads say you should be doing, and you are listening to that still small voice guiding you in what feels like the babiest of baby steps, take heart (Psalm 31). Do not be discouraged in what feels like rejection. Do not give up when you step out in faith and what looks like failure looms. It’s hard in a culture to see past the me, to the we, but the dream God has for his children is so much bigger than you or I. It’s a bigger picture. We’re individually contributing to His masterpiece. Do not be discouraged. Your sisters are so proud of you. We believe in you. Do not be discouraged. Your sisters in this dreaming adventure are so proud of you. We believe in you. We are standing a little further up the course cheering you forward. And if you found this and you have gotten lost along the way, we are praying for you today. You are always welcome home. It. Is. Never. Too. Late. You are always welcome home. It. Is. Never. Too. Late. Who knew where this dreaming journey would carry us. I look back on the three years that have elapsed since we set out together, and I marvel at God. 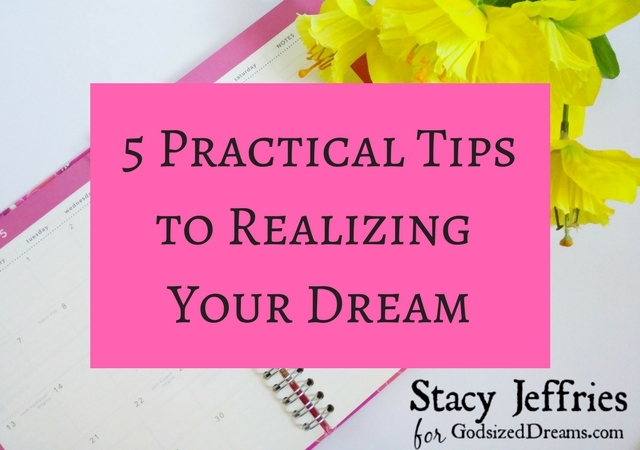 As a group of dreamers, few of us are pursuing the dreams we thought God had for us. By the same token however, I believe every single one of us is pursuing a God-Sized Dream…and that is the way of the Kingdom. That takes me back to the beginning of this journey with my sisters, and inclines me to encourage you, again, never to give up. You might want to give up on a dream, but don’t ever be tempted to give up on God. He’s never given up on you, and He never will. This goes back about a couple of years. It hadn’t been a banner week. The flu virus moved into our house, contractors overtook our home for the week rebuilding and repairing the bathroom, and all of my usually boundless energy and motivation had evaporated. I found myself in the uncomfortable and unaccustomed position of feeling a little pathetic. It’s unfamiliar and I never like it. At that moment, I was overwhelmed by the love, faith, and drive of the women chosen to walk this path with me-the women of God-sized Dreams. While I often spend my days writing, at other times I quiet my soul reading their stories here and elsewhere across the web. Just listening to God speak through these women and their dreams, I feel a stirring. Never have I had a group of Christian women friends like these women. 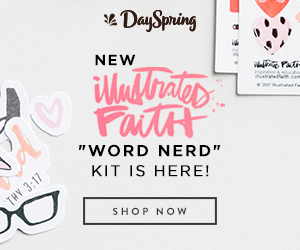 Not one to travel in a girl pack, I live my faith but I’m fairly private (I have a close circle of friends), and growing up PK (a pastor’s kid), I’ve seen so much in communities of faith that has disappointed me that I am disinclined to hang with church folk. I receive the words as a reminder to get over myself. Surrounded by such a great cloud of witnesses, women whose lives and whose stories and whose faith lift me out of my mire (which I remind myself are merely a series of inconveniences) that it’s time to dust myself off, throw off all that might hinder me, and persevere. That’s a lesson I encourage you to remember when things get rough. They will (get rough, I mean). I have a great tool for that. Or actually, Holley Gerth does. She and God created this great tool, to which I return often, called, The Do What You Can Plan. The Do What You Can Plan. It’s an instructional manual for eating the elephant (a bite at a time). You see, I never pull myself out of the mire of my life in a moment’s notice, so that’s where the plan comes in. Even at our lowest, we can take baby steps. I’ve learned to remind myself to start where I am, and do what I can. And, in the company of my powerful praying sisters, when I am weary, I come to them and drink from the fount. I needn’t even confess my struggles there-there is a word someone needs to say that I need to hear. That is how it is with God. That is how it is with my sisters. I read the words of my sisters, and I am encouraged. I read from Holley’s book, and am reminded how to eat the elephant. And that is all you need to throw off everything that hinders, along with the sin (in the form of fear, anxiety, doubt) that so easily entangles. Do not grow weary and lose heart. You might be down, you might even be broken, but that very brokenness will be the key to your healing. And I’ve got all my sisters with me-we are your sisters too, and among them here is what I’ve learned.